Sat., Sept. 30, 2017, 10:34 p.m.
Jenna Kuehn had 12 kills and 11 digs and Faith Smith dished out a team-high 34 assists to lead the Gonzaga Bulldogs (9-7, 4-0) to a 3-2 win over the San Fancisco Dons (3-15, 0-4) in five sets (13-25, 16-25, 25-21, 25-16 15-5) in a West Coast Conference match in San Francisco. The Zags fell behind quickly, dropping the first two sets before rallying in the final three frames. GU jumped to a 10-4 lead in the final set before USF claimed its last point of the day on a service error. The Zags finished the match with a 5-0 run, including back-to-back kills by Sarah Penner to win the frame 15-5. Gonzaga hosts Pepperdine on Thursday at 6 p.m.
Southern California 3, Washington State 1: Khalia Lanier had 23 kills and nine digs to lead the No. 20 Trojans (12-3, 3-0) in a win over the Cougars (12-3, 1-2) in four sets (25-15, 25-27, 25-12, 25-19) in Pac-12 play in Los Angeles. The Trojans outscored WSU in kills (61-36) and digs (52-39), and seved 11 aces while holding the Cougars to none. McKenna Woodford and Taylor Mims led the Cougars with 11 kills apiece, with Mims hitting .381. WSU plays at UCLA in Los Angeles on Sunday at 1 p.m.
North Dakota 3, Eastern Washington 0: Sydney Griffin had 10 digs and 26 assists as the Fighting Hawks (19-2, 4-0) downed the Eagles (5-8, 2-2) in straight sets (25-15, 25-12, 25-22) on Saturday in a Big Sky match in Grand Forks, North Dakota. The Eagles trailed by five points in the third frame before going on a 9-0 run to lead 13-10, their largest lead of the day. UND responded and pulled ahead with a 22-16 lead. The Eagles cut UND’s lead to three points before UND took the set 25-22. Regan Harr had 17 digs and 11 assists and Ashley Seiler notched 10 kills and 11 digs for teh Eagles, her sixth double-double of the season. The Eagles play at Northern Arizona in Flagstaff, Arizona, on Thursday at 7 p.m.
Idaho 3, Northern Colorado 0: Kaela Straw had 11 kills and Haylee Mathis dished out 30 assists, and the Vandals topped the Bears in straight sets (25-20, 26-24, 25-21) in Big Sky game in Greeley, Colorado. Idaho went on a 5-0 run in the final set to give them an 18-15 lead. Jayden McCartney equalized the score at 19 with a kill before the Vandals went on another run to jump back to a three-point lead. Mathis ended the match with a kill to seal a 25-21 win. The Vandals play at Southern Utah in Cedar City, Utah, on Thursday at 6 p.m.
Whitworth 3, George Fox 0: Emiko Kahler had 12 kills and 22 digs and Gracie Meiners tallied a game-high 36 assists, and the Pirates (8-6, 5-1) topped the Bruins (3-6, 2-4) in straight sets (25-17, 25-22, 30-28) in a Northwest Conference match in Newberg, Oregon. Whitworth hosts Pacific (Ore.) on Friday at 6 p.m.
CC Spokane 3, Yakima Valley 0: Kendall Collins had 13 digs and 24 assists as the Sasquatch defeated the Yaks in straight sets (25-18, 25-22, 25-23) in Northwest Athletic Conference play in Spokane. Joelle Mahowald had nine kills and Kaitlin Ramsey tallied 15 digs for the Sasquatch. 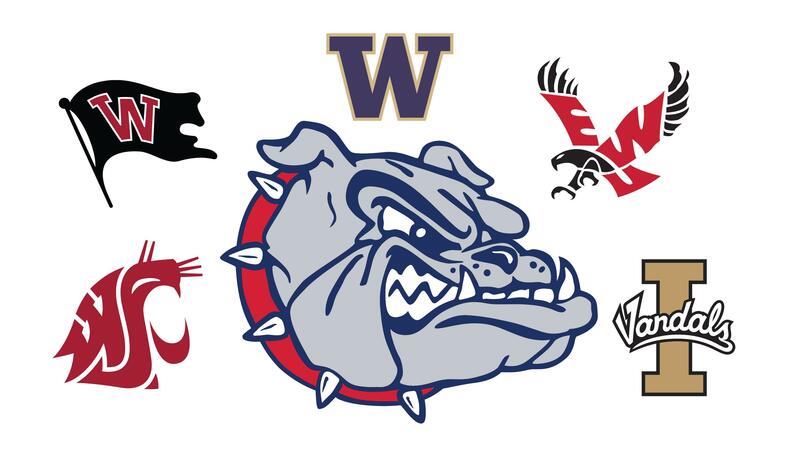 CC Spokane plays at North Idaho on Wednesday at 6 p.m.
Gonzaga 2, Denver 1 (OT): Christo Michaelson scored in overtime to lift the Bulldogs (6-3-1) past the Pioneers (5-5-0) in a nonconference match at Luger Field in Spokane. Gonzaga played the final eight minutes of regulation a man down. The Zags managed to power through, as Michaelson took a feed from Joe Corner and scored in just 58 seconds into extra time. It was Michaelson’s team-leading fourth goal of the season. Denver led the first half 1-0 with a goal by Kenny Akamatsu. Gonzaga’s Ben White answered with the equalizer in the 52nd minute on a penalty kick, his third score this season. Gonzaga begins conference play against Saint Mary’s on Saturday at 7 p.m. in Spokane. Willamette 3, Whitworth 1: Moi Diaz scored Whitworth’s only goal of the day before the Pirates (3-6-1, 1-3-1) fell to the Bearcats (6-3-0, 5-0-0) in an NWC game in Spokane. Diaz shot his third goal of the season off an assist by Jonah Snyder in the 79th minute. Willamette had a 1-0 lead heading into the second half before Alan Hernandez shot scored to put the Bearcats on top 2-0. Hernandez assisted Nicholas Ballenger five minutes later to pull Willamette to a 3-0 lead. Whitworth hosts Linfield on Sunday at 2:30 p.m.
CC Spokane 6, Blue Mountain 0: Chase Reidt assisted on three goals to help the Sasquatch rout the Timberwolves in an NWAC game in Pendleton, Oregon. CC Spokane plays at North Idaho on Wednesday at 4:15 p.m.
North Idaho, Tresure Valley: Omar Hernandez’s second half goal lifted the Cardinals to a draw with the Chukars in NWAC play in Ontario, Oregon. Treasure Island took a 2-1 lead in the first half, but the Cardinals held on in the second. Hernandez scored the equalizer in the 53rd minute to avoid a North Idaho loss. North Idaho hosts CC Spokane on Wednesday at 4:15 p.m.
Whitworth 2, Puget Sound 2 (2OT): The Pirates (5-3-1, 4-0-1) stayed undefeated in the NWC after drawing a tie with the Loggers (4-3-2, 2-2-1) in Spokane. The tie dropped Whitworth to second place in the conference standings with 13 points. Leah Corra got the Pirates on the board first with a goal in the 25th minute. Puget Sound tied the score at 1 at the start of the second half. Kelly Wucherer had a goal in the 64th minute to take back the lead for Whitworth. Peguet Sound’s Lura Morton scored the equalizer in the 89th minute to force the game into overtime. Neither team was able to score in overtime, leaving the score tied after 110 minutes. The Pirates host Pacific Lutheran on Sunday at 12 p.m.
North Idaho 5, Treasure Valley 1: Ellory Ferris scored her first two goals of the season to lead the Cardinals in thier rout of the Chukars in a NWC game in Ontario, Oregon. Ferriss first goal in the 19th minute gave the Cardinals a 2-0 lead heading into the second half. Amber Spaulding scored Treasure Valley’s lone goal of the day at the start of the second half, but the Cardinals pulled away with three second-half makes, including Ferris’ second goal that came on a free kick in the 71st minute. North idaho hosts CC Spokane on Wednesday at 2 p.m.
CC Spokane 14, Blue Mountain 0: Sabrina Castaneda and Jamie Fassler both scored a hat trick to lead the Sasquatch in a runaway win over the Timberwolves in an NWAC match in Pendleton, Oregon. CC Spokane plays at North Idaho on Wednesday at 2 p.m. Published: Sept. 30, 2017, 10:34 p.m.